There are rock memoirs and then there is this one. A Fast Ride Out of Here tells a story that is so shocking, so outrageous, so packed with excess and leading to such uproar and tragic consequences as to be almost beyond compare. 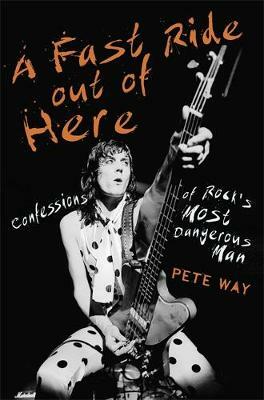 Put simply, in terms of jaw-dropping incident, self-destruction and all-round craziness, Pete Way's rock'n'roll life makes even Keith Richards's appear routine and Ozzy Osbourne seem positively mild-mannered in comparison. Not for nothing did Nikki Sixx, bassist with LA shock-rockers Motley Crue and who 'died' for eight minutes following a heroin overdose in 1988, consider that he was a disciple of and apprenticed to Way. During a forty-year career as founding member and bassist of the venerated British hard rock band UFO, and which has also included a stint in his hell-raising buddy Ozzy's band, Pete Way has both scaled giddy heights and plunged to unfathomable lows. A heroin addict for more than ten years, he blew millions on drugs and booze and left behind him a trail of chaos and carnage. The human cost of this runs to six marriages, four divorces, a pair of estranged daughters and two dead ex-wives. Latterly, Way has fought cancer, but has survived it all and is now ready to tell his extraordinary tale. By turns hilarious, heart-rending, mordant, scabrous, self-lacerating, brutally honest and entirely compulsive, A Fast Ride Out of Here will be a monument to rock'n'roll debauchery on an epic, unparalleled scale and also to one man's sheer indestructability.